Good and successful wine-paring is hard to achieve. You know, the kind that makes you so happy and content; the kind that feels like everything is right in the world. There are many factors involved, some of which are highly subjective, like your own state of mind. Trying to manufacture these special moments is nearly impossible. The winemaker himself (or a chef) would have a better batting average at coming up with some awesome wine pairings. So I had a lucky break a few nights ago. I opened a bottle of Spanish wine for dinner (grilled steak and vegetables): Marqués de Riscal Rioja Reserva 2008. It’s nothing too fancy, you can find this wine at Trader Joe’s for $14.99 and I’ve been buying it since 2005. I tried a little taste as I always do right after opening the bottle, and let the wine breathe two hours before drinking my first glass. The wine was insanely good but the best was yet to come. After dinner came the cheese. We decided to try a new cheese also from Trader Joe’s. We bought Trader Joe’s “Mini Basque”, a cheese made with 100% sheep’s milk. Since we were drinking a Spanish wine, we got ourselves a Spanish cheese. Well, almost… The cheese is actually made in a small town called Larceveau in the Basque region (hence the name), on the French side of the Pyrénées. It is 40km away from the Spanish border, and less than 200km from the Marquès de Riscal winery. Pairing local food and wine from the same region will increase the chance of a good pairing, bringing up the famous saying “if it grows together, it goes together”. Aged for about 70 days, that cheese is on the younger side and still maintains a certain level of artistry that places it amongst great cheeses like Comté, Camembert and even Roquefort. It has become one of my favorite cheeses of all time. Mild and nutty, firm and slightly fruity, this cheese isn’t overly complex, making it an ideal candidate for introducing beginners to the world of sheep’s milk. The Mini Basque Cheese is crafted in small, cylindrical wheels weighing about 1 pound. When cold, you’ll find it firm, but if you allow it to warm up to room temperature, the texture becomes softer, the flavor richer, and the color leans towards light caramel. 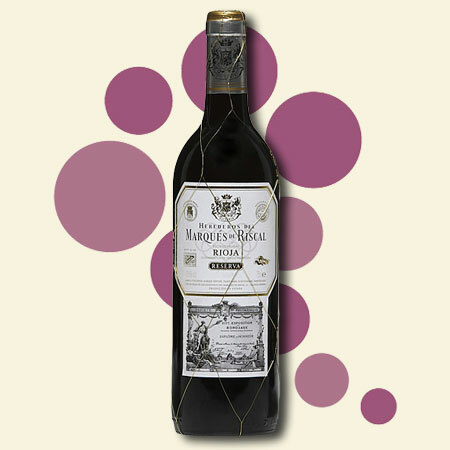 The wine is a blend with a strong predominance of Tempranillo (Tempranillo 90%, Graciano 7%, Mazuelo 3%). It is aged in wine barrels for a total of 25 months, after which it is bottled and rounded off for another year before being released for sale; time enough to show how much complexity Tempranillo is able to achieve. The 2008 vintage attains a perfect balance of taste vs. alcohol (13.5%). It is full and tasty, with good structure and elegant tannins. The finish is long and fresh, with a slight reminder of fine oak. 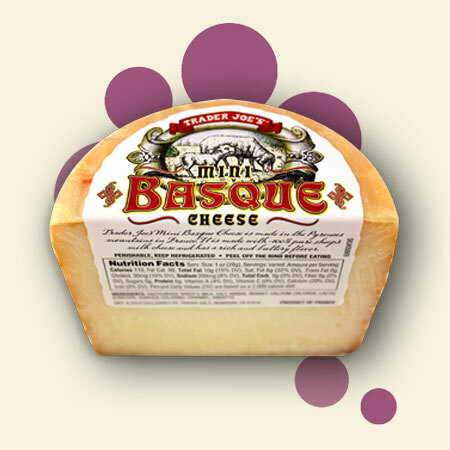 Its subtile acidity level creates a perfect match for the “Mini Basque” cheese and its delicate, yet decidedly “sheep” flavor profile. So the next time you find yourself at trader Joe’s, get some Marquès de Riscal, half a wheel of Mini Basque cheese and do yourself a favor, skip those flimsy useless crackers and get yourself some REAL bread. I recommend using a high-quality artisan bread, which you can also find at Trader Joe’s. Pop it in the oven for 5-10 minutes for a thicker crust and stronger flavor. My wife and I really enjoyed pairing this wine with this cheese a few nights ago, and we have been doing it since. Once again, I can’t guarantee this will happen to everyone reading this article, but give it a try and see for yourself. Don’t forget to let me know what you think, because sharing is really what it’s all about. • Wine Pairing Is Fun!